The Hollies Goes to Mallow! This was the first strawbale house I built that was my sole responsibility. It was a terrifying and exhilarating experience. The Hollies was behind what is probably Ireland’s most visited strawbale house, at the Cork Racecourse Mallow for the Mallow Homes and Gardens Festival. You may have read about it in the papers, it had a lot of coverage. It was a huge success, and the finished house stole the show. In this article, Rob Hopkins explains how the house was built and the impression it left on those who visited it. It was mid-April that the Festival organisers asked me to build them a strawbale house, which had to be finished in time for the Festival at the end of June. We decided the best way to proceed was to run the wall raising as a course, and fixed the date for the first weekend in May. On the weekend of 5th-6th May, 15 people from all over Ireland gathered to raise the walls. We started on the Friday evening with a talk and slide show about strawbale building and then on Saturday morning we were all raring to go. The building used the ‘Nebraska’ method, where the weight of the roof is carried directly on the walls. The wall raisers set to the task in hand with enthusiasm and there was a great atmosphere. The window boxes were made using scrap wood from on the site and from the fourth course of bales upwards we used hazel coppice rods to pin the bales together. When we reached the seventh and final course of bales we lifted the roofplate into position on the walls and fixed it all around to make a continual plate. This was then strapped down to the foundation using stainless steel cables and pinned into place using hazel rods. All in all it had taken two days to raise the walls – not bad going for a group of people who had done very little or no building before! While the Festival crew set about putting the roof on, I set about preparing the building for plastering. This involved giving the house a ‘haircut’, that is, trimming all the loose straw to make it a consistent surface for plastering onto. The other job was to fix expanded metal lath around the windows for the plaster to adhere to. Once the walls were ready for plastering that was my part of the housebuilding finished. It was then over to the plasterers from Cor Castle in Innishannon, Co. Cork who were sponsoring the lime plastering and who ran two weekend courses on plastering. I was then away for 2 weeks, during which time the Cor Castle team and the Festival crew finished off the roof and the plastering as well as fitting the windows and doors. In the run up to the Festival most of the press coverage was about the house. Come the first day of the Festival the house had been fitted out with sheeps’ wool insulation from Triscle Heating near Macroom. 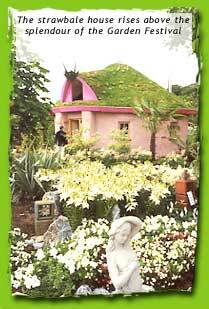 The roof had been finished off with a very neat turf roof with flowers planted in it, leading many to christen it ‘The Tellytubbies’ House’. During the four days of the Festival I did four talks and slide shows a day about natural building in the house and was there to answer questions. The vast majority of the many thousands of people who came to the Festival visited the house. Some even travelled from all over the country just to see the house. People responded to the house in many different ways. Older people loved the windows, small sash windows set in deep reveals, very like the old cottages many of them would have grown up in. Younger people, more used to modern concrete buildings, loved the feeling of the natural materials and the playfulness of the structure. What really impressed me about the finished building was that even though it was created with the idea of modelling sustainability in practice, none of that was upfront. It was just a beautiful, playful house with a Tellytubbies roof. But once people came inside and the questions started flowing, you could see their preconceptions crumble – it came with no dogmatic agenda about green building, it wasn’t called ‘the Green Home’ or ‘the Eco Home’ or anything, it came in under the radar as it were. However, if anything, it had more of an impact because of that. I’m a great believer that showing people working practical solutions they can feel and touch is far more effective than any amount of teaching and campaigning. The Mallow strawbale house was so effective and powerful because it was presented to ordinary people as something non-threatening and non-challenging, yet it challenged them profoundly nonetheless. I came away from the Festival with a very strong feeling that those of us doing natural building and permaculture are on the edge of something that is going to be huge. In Ireland, with its ‘Celtic Tiger’ booming economy, where a young couple without £100,000 can either forget ever owning a house, or can sign up to a massive mortgage to burden themselves for many years to come just to buy a soulless cardboard box of a house, we have the solutions for the questions people are just (finally) starting to ask. With this strawbale house, as well as the other innovative natural structures springing up around Ireland, we have started to build something which is going to be massive, and judging by the amount of media interest it has generated since, something whose time has come. The Mallow strawbale house was sponsored by The Hollies Centre for Practical Sustainability, The Mallow Homes and Gardens Festival, Cor Castle Lime Products and by Triscle Heating. Many thanks to the inexhaustible Dominick Cullnane without whose vision and sweat it would never have happened. Thanks also to Barbara Jones for her supportive ‘panicked strawbale builders hotline’! Thanks also to everyone who helped, Ger, Niall, Saul, Graham, Paul, Fergal, G ionata, Thomas , Ulrike, Chrstof, Eoin, Callista, Alan, Sheila, Ciaran, Jim, Diarmuid, Stephan, Richard, Kevin, Roy and all at Loch Place, Colin and the other Mallow lads.